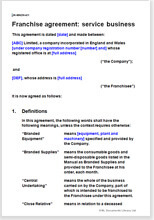 This is a franchise agreement for a business that predominantly sells services to other businesses or to consumers. The company may also sell goods, such as branded consumables. The different types of business for which this agreement is suitable are vast and could range from branded dance classes to cleaning services, to professional service provision such as accountancy or law. The agreement covers an enormous number of issues important to franchising and we believe it is comprehensive enough to be used by the largest franchise chains. For smaller businesses, it should be an ideal basis from which to craft an agreement that not only protects the rights of the franchisor, but also impresses prospective franchisees. Businesses that sell to B2B, B2C or both. Such a model would be common in many service companies, from accountants to plumbers to dog walking services. A good example of this type of business is a dance fitness company: the franchisor provides the franchisee with regularly updated music compilations and dance routines that the franchisee teaches to individuals who subscribe to a series of classes. Where the franchisor has developed equipment or machinery that is used to provide a differentiated service. For example, a franchisor may develop an advanced glass cleaning machine that is used by franchisees to provide a window cleaning service.